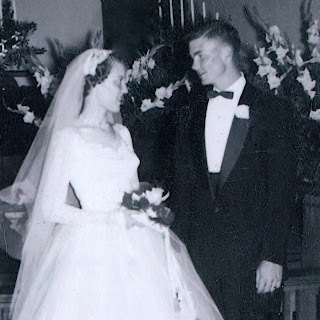 Being as I wrote a book about four brides and a wedding dress, I asked some author friends to share their wedding pictures and stories with me. Now I'm sharing them with you! First up, the beautiful Deborah Raney! "When I met Ken Raney and it was almost love at first sight. We dated all summer, but in the fall, we went off to different colleges 60 miles apart (Ken is 2 years older than I am and was starting his junior year). But we'd already fallen hard for each other and had even started using the "M" word. In October Ken planned to come visit me at my college and wrote to tell me he was bringing me something exciting. He gave me clues: round, shiny, hole in the middle, and it would always make me think of him. Well, woohoo, I polished my fingernails and prepared to receive my engagement ring! WRONG. You know what that man brought me? A Monkee's record album. (Hey, hey, we're the Monkees!) He thought this was SOOOO funny. Well, it was round, shiny, had a hole in the middle and had a stupid song on it that was supposed to make me think of him. I was NOT amused. But we DID get engaged that Thanksgiving and I got my diamond for Christmas. 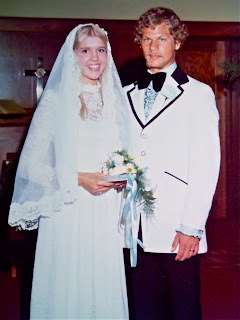 We married the following August, 1974. Almost 38 years now! Ken, pull a prank like that? no way! LOL! Oh, that's so great. It's so fun to read these real life love stories. I can't wait to read more! Oh, how fun! We're on your blog! : ) I'm so excited about this series and can't wait for the other wedding dresses and stories! BTW, speaking of wedding dresses, I should have mentioned that my sweet mom MADE my dress and my veil, and our oldest daughter wore the veil in her wedding (attached as a hairpiece, not mantilla style). Wonderful memories! Thanks for commenting, everyone! I loved Deb and Ken's story too! I think Deb is a beautiful bride but I MUST confess she's gotten ten more so with age! Thanks for being here today Deb! * LOL. I see my typo! "even more so with age!" Not "ten more" but hey, that might work too Deb! Hey, I'll take 10 more of whatever! LOL! Too funny about the Monkee's Album! Did you tell him what you thought it was going to be? Oh, yes, Jennifer. It was discussed at length! LOL! I had to throw that out there, Deb. My parents were sorting through records years ago and I asked if it was a "big CD". LOL, that sounds like something my husband would've done. Arghhhh!